Author Francis Bicknell Carpenter, a New York artist, believed that the Emancipation Proclamation was "an act unparalleled for moral grandeur in the history of mankind." Carpenter had a deep respect for Lincoln‚Äôs action, and he had an impulse to capture it on canvas, to exalt the moment of the first reading of the proclamation. About a year after President Lincoln made his famous proclamation, Carpenter acted on this impulse. He asked Owen Lovejoy, an Illinois Representative, to arrange for him to paint the subject at the White House-in fact, eventually, to set up a studio in the State Dining Room. On February 6, 1864, Carpenter met Lincoln, and the project began. 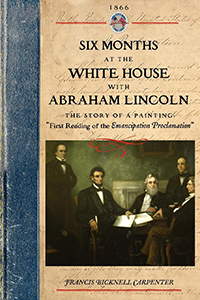 His extraordinary extended residence in the White House resulted in the painting and in this informative, sometimes moving, 1866 memoir, Six Months at the White House with Abraham Lincoln. The painting hangs today in the U.S. Capitol over the west staircase in the Senate wing.